After you go to the tasting you won't go anywhere else. The staff is amazing and all of the food was absolutely delicious. I have heard so many wonderful things about them from numerous vendors and brides and all the praise is definitely warranted. Our compliments to the chef, etal! The Italian buffet was delicious, compliments everywhere! The staff was friendly, courteous and professional! We will use them again! We really can't say enough good things about Cook Shack after our wedding! We looked at a few different catering companies in the Raleigh area before our event and Cook Shack was by FAR the best value anywhere around! Their food is incredible, tastes like your mom's home cooking (everyone at our wedding was raving about the brisket!) and their staff is so incredibly sweet and accommodating. They will go out of their way to make sure you have exactly what you want and PLENTY of it. These guys are wonderful, you won't regret hiring them. Thank you for such an amazing review!!!! We loved being a part of your special day. We are dying for another opportunity to hire Cook Shack - one of the saddest parts of our wedding being over is that we don’t know when we’ll be able to enjoy their delicious food again! We knew from our private tasting that Cook Shack was the one, and we immediately cancelled all other scheduled tastings. Austin and Tracey are extremely kind and helpful, rates are incredibly reasonable, and the team took such great care of us from the moment we first reached out until every last bite of our leftovers was devoured in the days following our wedding. At our tasting, we added several items to our menu that we never thought we’d have any reason to include – like warm pimento cheese dip with homemade pita chips - where has that been all my life? Other apps of chicken and waffles, bacon wrapped shrimp, and fruit/veggie/cheese platter were a huge hit (the team also kindly prepared a huge appetizer tray for the bridal party to enjoy during photos). We served a buffet w/ awesome salad, beef kbobs, lemon rosemary chicken, sweet potato soufflé, asparagus, and mac & cheese, and finished the night with a biscuit bar with all the toppings. Cook Shack also provided bartending services (we provided alcohol) and we heard many compliments throughout the night about how great they were, as well as how friendly/helpful Cook Shack servers were. Throughout planning, Tracey was amazingly responsive to my million questions about timing, rentals, cake cutting, real vs. disposable dishes, head count, layout, bar logistics, etc. They were so sweet to send us home with plates of food (including utensils and a mini bottle of champagne! ), as well as a gift basket with homemade sauces and t-shirts. They packaged leftovers and helped with loading leftover alcohol. So delicious/fresh/homemade, personalized, stress-free, and a dream of a catering experience – thank you, Cook Shack, for making our experience seamless and so delectable! Cook Shack is the best of the best – you won’t be disappointed! Thank you for allowing us to be a part of your special day!!! We honestly do have the best brides !!!!! Cook Shack was PHENOMENAL! We found them through the recommendations of our Wedding Coordinator, and upon reaching out was impressed by their options, pricing, responsiveness, and customer service! From the start Tracey was so so friendly! We (at the time) lived 3 hours away and they accommodated us for a private tasting for our big day. When we arrived, we had no idea what we were in for - imagine the best food ever.... and then triple that! Austin and his assistant were so wonderful - it was like we were dining with old friends! We left a bit later and were in a food coma of deliciousness! We didn't even have to try out any other catering company - we knew Cook Shack had to be the ones to handle our big day. We ended up moving out of state during the engagement, and throughout my many questions, they were very responsive and kind - and believe me I ask a LOT of questions. On our big day, they were even better than imagined. People have been raving about the food since social hour. They brought us our food and made us to go plates - which we ate as soon as we reached the hotel. Their staff was polite and delightful to us and all of our guests. We also loved the option of having them donate the leftovers to homeless shelters. If you are in between on catering companies for your big event - look no further! They are SO WORTH IT! Thanks Tracey and Austin!! Thank you so much for the kind words!!! We enjoyed working with you guys so much and helping make your big day great!!! Cook Shack was absolutely fantastic for our wedding. They were one of the caterers we had to choose from at our venue and luckily we had their food at a friend's wedding and were able to taste at a tasting event at the venue. We knew by both experiences that we had to use Cook Shack. Tracey and Austin were awesome and so easy to work with. They are extremely responsive and helpful. The actual tasting we had for our wedding was such an awesome experience. There was so much food to try and everything was fantastic. The day of the wedding was a dream. They were so professional and the food was again perfect. We went with a plated dinner which we were told wasn't what they usually are used to, but it turned out perfectly. The service was fantastic with everyone being served very quickly. Guests are still raving about the food! We would recommend Cook Shack to anyone looking for the best service and food quality! Kara & David we loved being a part of your big day!!! You guys were amazing to work with and your wedding was absolutely beautiful!!! Austin Murray and his Cook Shack team exceeded every expectation at my daughters recent wedding. For starters we actually visited his business location in Louisburg and sampled various dishes with our wedding planner. Convinced that all the food was the highest quality made it easy to pick out our favorite appetizers and entrees. Since the wedding I have had no fewer than 50 people tell me it was the best food they have ever gotten at a catered event. I wholeheartedly agree. The staff was perfectly professional and served 300 guests with Ease.....And now the best part....The cost was very reasonable for the quality received. If you are planning any event I would strongly recommend Cook Shack . If you are looking for an amazing caterer for your wedding or any event look no further, Cook Shack Catering is the absolute best! Throughout my entire wedding planning Cook Shack Catering was so easy and friendly to work with. It was difficult for my husband and me to pick our wedding food, because all of their food was absolutely delicious. We ended up going with Shrimp and Grits, Chicken and Waffles, and a Cheese Tray for our appetizers. Our meal consisted of Beef Brisket, Chicken Pot Pie, Mac and Cheese, String Beans, Salad, Cornbread. Let me tell you, we received SO MANY compliments from everyone saying the food was outstanding. Food is not the only thing Cook Shack has going for them, their service is impeccable. Their staff did a fabulous job bartending and catering at our wedding. They even prepared to-go food for my husband and I and the sweetest honeymoon package to take with us when we departed from our wedding. I could just go on and on about Cook Shack, they are good people! Thank you for making our day so special, we are forever grateful! Thank you for allowing us to be apart of your big day!!! We met with two caterers, both were great, but Cook Shack options are far superior and the food is AMAZING. Austin and his team were professional from beginning to end. The weather was a huge factor and the staff were flipping tables and re-arranging last minute - I have never seen people work so hard in POURING down rain like ever before. The food was awesome and people are still talking about his waffles. STILL TALKING about THE WAFFLES, NOT THE BRIDE! LOL! I would not hesitate using them for every catering event personally and will recommend them to anyone looking. You will not be disappointed! Thank you Austin and his team! YOU ARE THE BEST! So glad that we were able to work for you guys!!! And the rain is just another special memory to the wonderful day. The Cook Shack team was amazing! Tracey was incredibly helpful during the planning process and Austin provided a tasting to help us decide the menu. We did a family style meal and everyone RAVED about the food. It was so so good! The spicy mac and cheese is something everyone still talks about. Cook Shack is incredibly affordable and you really get access to a great team. Choosing Cook Shack was a great decision! Thank you so much for allowing us to be a part of your big day!!! You guys were awesome to work with. We cannot say enough great things about Cook Shack! We used them as a preferred vendor at the Sutherland and they were wonderful! 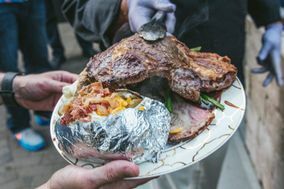 Our B-B-Que menu was done to perfection and everyone at the rehearsal dinner was raving about the food for days! The bride and groom did a tasting and it surpassed their exceptions! The hot pimento cheese dip appetizer is to die for! There was great communication with Tracey and Austin even threw in some wonderful cooked apples on our buffet that we had not even asked for! Needless to say we had plenty of food! The leftovers will not go to waste! They were willing to work with us as we were from out of sate to insure everything was done to our liking. They even let us ship a dessert from Ohio to them to serve! Their attention to detail, their wonderful staff and fabulous food made it a very enjoyable evening for everyone! We highly recommend them! Almost 3 weeks out from our wedding and everyone still cannot stop talking about the food. From the moment we contacted the Cook Shack about scheduling a tasting we knew there was something different about this company. They make you feel like you are part of their Cook Shack family from the moment of first contact until the last bit of food is packed away. Throughout the process the Cook Shack sends your personalized notes and they are always available with any questions you may have regarding catering and beyond. At our tasting we were paired with another couple who tried a menu completely different from ours. I do not think there is ANYTHING the Cook Shack cannot cook. The Grilled Potato Salad and Biscuit Bar were a huge hit. We were blown away when they brought over a table with all our appetizer choices, drinks for the bridal party, and covered it with a table cloth during pictures. The excellent service continued throughout the night we never had to ask for anything, were brought our meals, had to go boxes packed for us, and they even sent my parents home with large platters of food. Our guest all commented on how there was impeccable service and food through the night. There was not a cup empty nor a belly not full. We loved being a part of your big day!!! Everything was beautiful. I can't rate Cookshack high enough! We used them for our wedding at the Merrimon Wynne in Raleigh, and couldn't be happier. Right from the beginning of the tasting, they treated us so kindly and were so easy to work with. They adapted my late grandfather's ham and swiss rolls and my granfather's favorite bread pudding - it meant so much to pay homage to them. Guests are still telling me how much they loved the food - especially the barbecue and the "not-your-average-wedding-chicken" stuffed chicken breast! Thanks again, guys! Thank you guys for allowing us to be a part of your wedding!!! We are thrilled that your guest loved the food that picked out. We were more than happy to incorporate some of your family favorites!!! We used Cook Shack Catering for my daughter's wedding . It was held at The Oaks at Salem in Apex, NC. Austin and his team at Cook Shack Catering totally exceeded expectations. Their food was excellent-classic NC bbq cooked to perfection. His team was professional, helpful and made the entire process easy and worry free. Their menu is extensive and they were willing to customize dishes. I highly, highly recommend Cook Shack Catering! We loved being a part of your daughter's big day!!! You guys were awesome to work for and we hope that we are able to help you out in the future. Cook Shack was a pleasure to work with. They were so great at listening to our needs. Several other vendors we spoke with didnt let us shy away from their menu but Cook Shack was more than willing to offer anything we dreamt of. The team is professional and as organized as it gets. Aside from their amazing customer service, let me talk FOOD! It was all incredible. Everyone commented on how amazing the food tasted and looked! I would recommend them to ANYONE looking for a caterer, whether its a wedding, corporate event, or more! We LOVED being a part of your wedding day!!! Cook Shack is the very best!! Cook Shack catered our daughter's wedding, Oct 28, 2017 at The Sutherland in Wake Forest. From our first meeting at the tasting, we knew Austin and Tracey were something special. We had such a great time that evening tasting Asian won tons, Filet on a Fry, Hot Pimento & Cheese Dip, and Crab Dip. The main course selections of chicken, brisket, and steak were over the top accompanied by roasted vegetables and a mashed potato bar. It was simple to say yes to everything and even add some surprises like a s'mores bar and late night sliders to our wedding selections. Even with all these choices, creating a great feast for our 280 guests, the price was still extremely reasonable. Above and beyond the spectacular food was Cook Shack's first class service. Everyone on the Cook Shack team was helpful and kind. Our water glasses were never empty, there was plenty of food, and the buffet ran seamlessly. Austin checked with us numerous times during the reception to see if we needed anything. He even made sure the babysitters and children inside the house had food. At the end of the night, the bride and groom had a special array of food to take with them, and we received yummy leftovers too. I highly recommend Cook Shack and look forward to working with them again. After all, they practically feel like family! Our wedding was amazing all thanks to the wonderful staff at Cook Shack! The food was absolutely wonderful and they made sure our guest as well as the bridal party were well taken care of! People are still raving about the food today from our wedding day! Thanks Cook Shack for being apart of our special day and making our wedding day everything we could have imagined!! This place is absolutely amazing. It is a must for your wedding and or any function that you may have. This organization is a family run facility. They are ALL extremely friendly and care about what they do. Their food is absolutely excellent. People are still talking about how amazing everything was (we got married on Sept 10 2017). They made sure that we ate immediately after the ceremony. Filled up our plate with all of the options, including the kids meals. They asked if we need a drink several times during the night. Made sure all of our guests were happy. They also packed up a to go container for us and all of the leftovers. As well as, giving us a gift basket. This place is a must. Their menu is very extensive, and their food is absolutely to die for. Thank you for the excellent review!! We are glad that we were able to be a part of your beautiful day!! AMAZING!! One word describes Cook Shack Catering. Our catering search for my daughter's wedding reception ended after our first meeting with Austin and Tracey. They made us feel like their most valuable client. They listened to our ideas and made helpful suggestions when we needed them. They were approachable and responsive throughout the wedding planning process. The reception was fabulous!! The food was exceptional with stellar reviews from our guest, the lemon rosemary chicken was fantastic and crowd favorite was the beef brisket. Their attention to detail was perfect and their waitstaff was kind and professional. Special attention was given to the bride and groom throughout the evening to make sure they had everything they needed, from food to beverage. You know that you hit it out of the park when guest call two weeks later asking who the caterer was because they want to recommend them to a friend. You only get one go at a perfect reception...that is exactly what we got with Cook Shack....Perfect!! Thanks Austin, Tracey and the Cook Shack Team. We enjoyed being a part of Savannah and Dylan's big day!!! Everything was beautiful and you guys were so awesome to work with!! I can't say enough good things about the Cook Shack! They are very responsive and easy to work with and also very professional in every sense of the word. They are an affordable caterer who does everything top notch with AMAZING food!! If you are on the fence with who to choose for a caterer, look no further! You will be sadly mistaken if you do not go with the Cook Shack! Amy we enjoyed being a part of your special day. If we are able to help you with anything in the future please let me know. If I could give Cook Shack more than 5 stars, I would. Cook Shack went above and beyond their role in our wedding. Even from the beginning stages, Tracey and Austin were so supportive and responsive to our needs and wants. They made suggestions when we needed them, and we're open to our specific requests that were not necessarily in the contract. When it came down to the last few days before our wedding, I made several last minute requests that they welcomed with open arms. Regarding the food, the presentation of everything was absolutely stunning. Every selection we made for our menu was spot on (and let me say, I HIGHLY recommend the brisket). If you are looking for a caterer that performs above and beyond in all areas, cook Shack is the way to go. Didn't have a thing to worry about!! Thank you SO MUCH for making our wedding day perfect! We loved being at part of your big day!! Thanks for allowing us to serve you. Cook Shack catered our wedding in June, and let me just say...the food and service was awesome!! All of the guests raved about the food, and they are amazing people to work with! They were so down to earth and helpful in creating the perfect menu and price to meet our budget needs. Tracey helped me sort everything out, and made sure that I had everything that I needed, right down to galvanized buckets to ice our waters for the ceremony and how many tables, chairs, and linens I would need! Overall an amazing experience and I would suggest them to anyone and everyone. They have menu selections in all price ranges and work with other vendors to give you the most stress free experience! We loved being part of your big day!!! If you are even questioning which caterer to use, look no further. Cook Shack is seriously the best caterer there is out there. I worked in the wedding industry for several years, so for my own wedding... I wanted three things 1. Amazing tasting food 2. Food served well (right temperature, good timing, etc.) 3. And the best service out there. I promise you Cook Shack is all three of those things. Do not be fooled into thinking that BBQ is all they do best. They practically let my husband and I handpick our southern staple "stations". Although my wedding was pretty I think :), the number one thing our guests keep talking and raving about was the food!!! Austin, Tracey, and the Cook Shack Team are seriously the best out there. The food was amazing! Everyone is still raving about it and it's almost been three weeks! The folks at cook shack are so nice and helpful! We had no idea what we were getting into with catering and Tracey walked us through everything we needed! They make sure you're taken care of and they make sure you at least get a bite to eat! So sweet! 10/10 if you're in the NC triangle area and news an event catered look no further! Cook Shack catered our wedding Spring 2017. The food was phenomenal and the service was the BEST! Communication with them is superb. Tracey always emailed be back right away with answers to any questions I had. They even plated our dessert table and cut and served our wedding cake, neither of which they supplied the food for. All our guests raved about the fantastic food and great service. They boxed up all the leftover food, including the desserts and cake, and even put them in our vehicles. We wish they had a restaurant because we would be loyal customers!